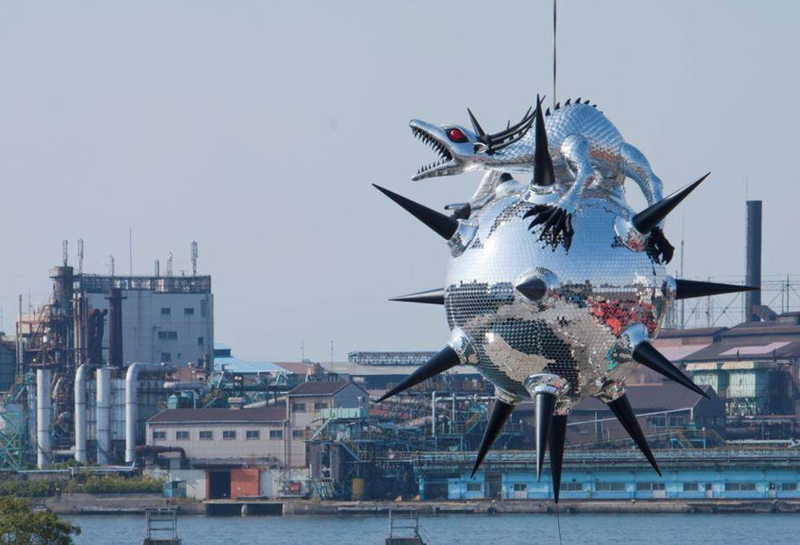 ‘Revitalisation’ is the keynote to the second Setouchi Triennale, an exhibition that uses contemporary art to bring new energies to a region in decline. The Seto Inland Sea is one of the most picturesque parts of Japan, with a diverse cultural heritage spread across a series of islands, large and small. Today, as in so many parts of this country, the region is suffering from depopulation and economic decline. A younger generation feels no attraction for the isolated lifestyle their ancestors enjoyed. Even if they did, traditional occupations such as fishing and seaweed harvesting have become increasingly difficult to sustain. Japan’s population decline has become so alarming the government is investigating ways to encourage people to have more children. It is the opposite problem to that faced by their neighbours, the Chinese, who have been forced to employ an unpopular one-child policy to control a population boom. The hermetic nature of Japanese society means there is almost no influx of new life from migration, while the high cost of living makes it impossible for most people to consider a large family. One sees the effects in rural areas such as the Seto Sea, or the mountainous Echigo-Tsumari district, where villages resemble retirement camps, full of old people bowed by lifetimes of hard labour. There are abandoned schools and empty houses, but everything is kept immaculately tidy. While decline in Australia leads inexorably to squalor, the Japanese are masterful at keeping up appearances. The other salient difference with Australia, is that a leading philanthropist, Soichiro Fukatake of Benesse Holdings, has taken depopulation and economic downturn as a reason for pouring money into these regions. In Australia, by contrast, corporate philanthropy is almost always conflated with sponsorship and the maximisation of publicity. Consequently, money is given – if given at all – to high-profile enterprises in the major cities. 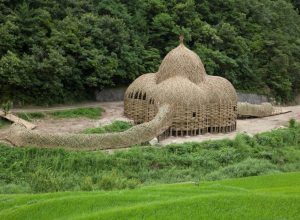 Fukatake, who is the major sponsor of both the Setouchi Triennale, and the Echigo-Tsumari Triennial, has provided a level of support worth many millions of dollars. 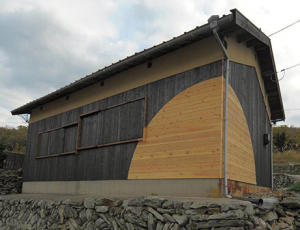 Not only has he bankrolled temporary exhibitions, he has commissioned the design and installation of new art centres on the islands in the Seto sea. He is also the force behind the success of Naoshima, the extraordinary island devoted to a synthesis between contemporary art, architecture and landscape. Naoshima is the centrepiece of the Triennale and now among Japan’s top five tourist attractions. When one learns there are no tax breaks in Japan for cultural donations, the grandeur of Fukatake’s gesture seems outlandish. He has two major motivations: a desire to help restore life to the region where his family have lived for generations, and a determination to prove that contemporary art can be a catalyst for that renewal. 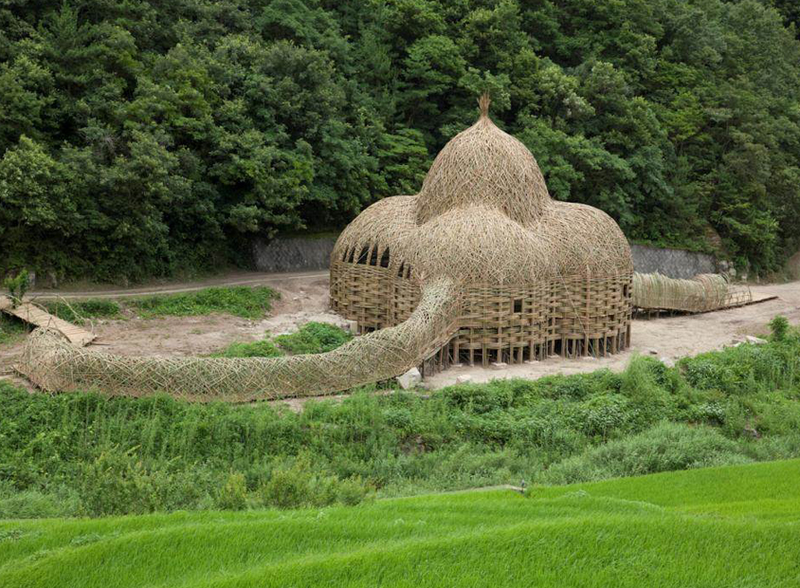 The second Setouchi Triennale represents a continuation of Fukatake’s collaboration with Fram Kitagawa, of Art Front Gallery, Tokyo, who has acted as artistic director for a long succession of these projects. One of the trademarks of these activities is that they only seem to grow larger and more ambitious over time. Consequently, this year’s Triennale is spread out over three seasons: Spring, Summer and Autumn. As the year progresses an ever increasing number of new works will be installed on the various islands of the Seto Sea, and at the ports of Takamatsu and Uno. The inaugural Triennale of 2010 featured the islands: Naoshima, Teshima, Megijima, Ogjima, Shodoshima and Inujima. By the end of the year the list will include Oshima, Shamijima, Honjima, Takajima, Awashima and Ibukijima. This is a challenging program, as it takes the best part of two hours by ferry from Takamatsu to reach the most distant islands. It requires a huge commitment of time on behalf of visitors willing to spend several days traversing the inland sea to visit art installations that may or may not appeal. This three-stage approach also allows artists to stage a progressive realisation of their works. 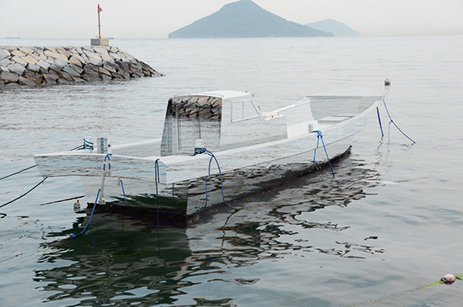 On the island of Shodoshima, for instance, the Japanese-American artist, Nobuho Nagasawa, has installed a tiny boat in an abandoned rice storage depot, coated in fibre-optics that pulsate and change colour in emulation of the sea. 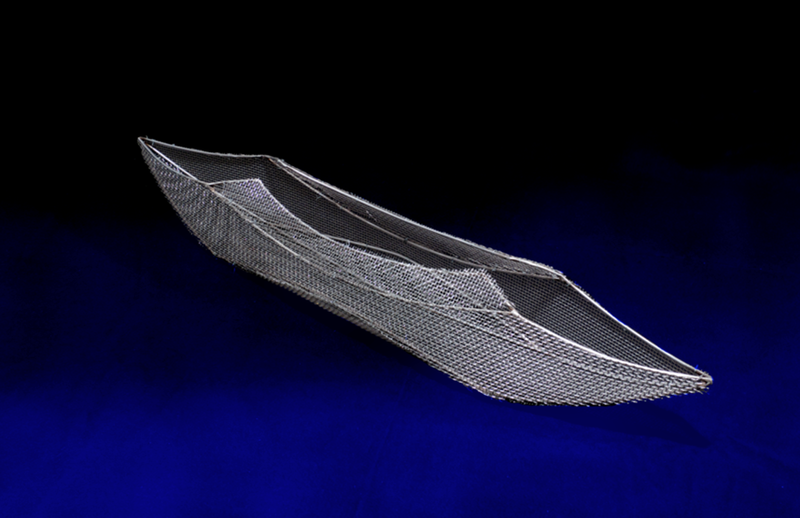 By Spring this boat will be replaced by a more spectacular full-scale version that occupies the entire room. Nagasawa insists that the small boat is not a maquette but a separate work, yet it acts as a kind of trailer for the piece to come. Shodoshima is the largest island in the group, and the only one in which the main port resembles a small city rather than a village. It is known for soya beans, olives, a former leper colony, and as the site of Keisuke Kinoshita’s famous film of 1954, Twenty-Four Eyes. In this year’s Triennale it plays host to some of the most subtle works, and to others that are blatantly over-the-top. In the latter category are Kenji Yanobe’s large-scale sculptures that echo the distinctive forms of Japanese manga and anime. 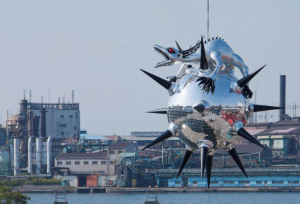 A steel dragon sits on top of a spiky globe by the portside. Further inland one encounters, Anger From the Bottom – a title that sounds a little odd in translation. This piece is a collaboration between Yanobe and Takeshi ‘Beat’ Kitano – renowned actor, film director and artist. It features a giant-sized demon with an axe embedded in its head that raises itself gradually from a well, opens its mouth, and dribbles a stream of water through rows of pointed teeth. It’s great entertainment, although perhaps too Disneyfied to be great art. One takes a very different impression from an elaborate project by American artist, James Jack, called Sunset House, realised over the course of three years with the assistance of a hundred local volunteers. These willing helpers have affixed their “hopes, dreams and memories” to the dirt walls of a house that formerly belonged to a stone cutter. 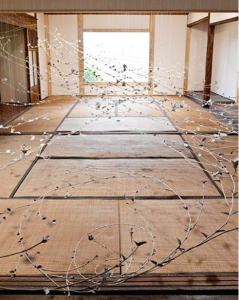 In typical Japanese fashion, the result is a pristine, orderly structure that looks as neat as a display home. Another notable work on Shodosima is Stories – House, a set of poetic video installations by young artist, Yume Akasaka. 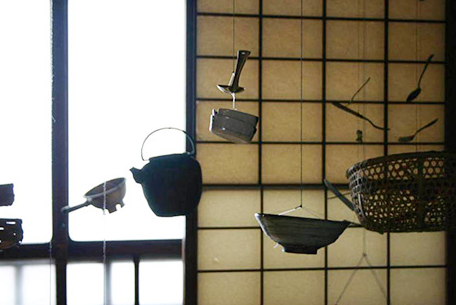 In the rooms of a traditional house, set around a courtyard, one finds a shadow play of farm animals, punctuated by the shining image of a fish that slides through the blackness as if traversing a pond. In another piece, a colourful wall hanging seems to implode and slide off the wall. What was impressive about these exercises was the sense that each has the potential to be taken much further should funds and opportunity arise. On the island of Ogijima, the most original installation was a work entitled Sea Vine, by Haruki Takahashi, which consisted of a room filled with a network of flowering vines made entirely out of porcelain. The fragility of the work was set against the impression of writhing, organic life, in way that really has to be seen rather than described. As in 2010, when Healy and Cordeiro, Sue Pedley and Cameron Robbins participated, the island of Teshima played host to the Australian artists. This year it was the husband-and-wife team of Craig Walsh and Hiromi Tango, who lived and worked in the local community, creating a multi-faceted work called Traces – Blue. The central motif was a fishing boat that had been transformed by cladding every surface with a mirror. The boat floated in the harbor, reflecting the sea and the weather, at times becoming almost invisible. The second part of the work was found a few minutes away, in an abandoned house filled with soft objects created by Hiromi Tango and the local schoolchildren, and presented in the form of a vast cornucopia. A video on the back wall featured the voices and faces of local fishermen. It was a piece that dramatised one of the central tensions of the Setouchi enterprise – the contrast between singular works that stood out from the environment, and projects that resembled elaborate feats of community art. There is a sense, perhaps only a prejudice, that the singular works are superior to those pieces that involve many amateur creators. On the other hand, if the idea of social revitalisation through art is to have any lasting credibility it is important that the inhabitants of the islands feel they have a personal involvement in the works that are displayed. Walsh and Tango were perhaps unique in making a piece that addressed both sides of the equation. It remains to be seen whether an art event with ambitions for the broader community should consist of socially committed work, or whether it is enough to create a spectacle and savour the ripple effect. The jury is still out and may never return a verdict. As to whether an entire region can have its Mojo restored by contemporary art, regardless of its ultimate success or failure of this marvellous experiment, one can only admire the spirit that has brought it into being.